Just a quick post because I instagrammed a picture of last night’s dinner and have never felt more popular with calls for the recipe. We weren’t planning on doing another goat’s cheese recipe so close on the other one but you have to give the people what they want. This is a super simple salad but so tasty. Also, this basic concept has been changed numerous times depending on the season/what’s in the fridge/what looks good at the shops. Serves 3 HUNGRY adults who enjoy eating as a main, would probably serve 4 or 5 less greedy adults as a main. Would serve MANY as a side. Preheat oven to 180C and start cutting the skin of your pumpkin and cubing it up. Place it in a roasting dish and glug some oil over it and then sprinkle it with as much paprika as you desire. Toss everything so it get all covered in the oil and paprika. If you feel like it, some honey on the pumpkin could also be a taste sensation. (I forgot to do this.) Pop this is the oven and roast until soft i.e. however long it take you to do the rest of things. Check on it occasionally but it will be pretty happy to do its own thing. Rinse the quinoa. I put mine in a fine sieve and run it under water for a couple of minutes. I know other people rinse their again and again but I find that one rinse is enough. Put the rinsed quinoa, water and stock in a medium saucepan over high heat. When it starts to boil, turn it all the way down to low and put the lid on. Leave for approx 20 minutes. (Quinoa can be fickle and you’ll need to check it — with your mouth — to make sure it isn’t messing you around.) When most of the water has been absorbed, turn off the heat, leave the lid on and put to one side until the rest of your salad is ready. CHECK YOUR PUMPKIN. You can probably turn it off about now but you might as well leave it in the oven so you have more bench space until you need it. Heat a smidge of oil and butter in a small saucepan and sauté the spring onion, corn and thyme whilst you get to work on your asparagus. Break off the woody ends (literally snap it at the bottom; it knows where to break) and throw them away, chop off the leafy end bits and then slice the rest of the stalks. Put the leafy end bits and the sliced stalk in with the corn and cook for a couple of minutes. Find yourself a large bowl. If you are at our house, this is difficult as the usual one is full of lollies for trick or treaters tonight. 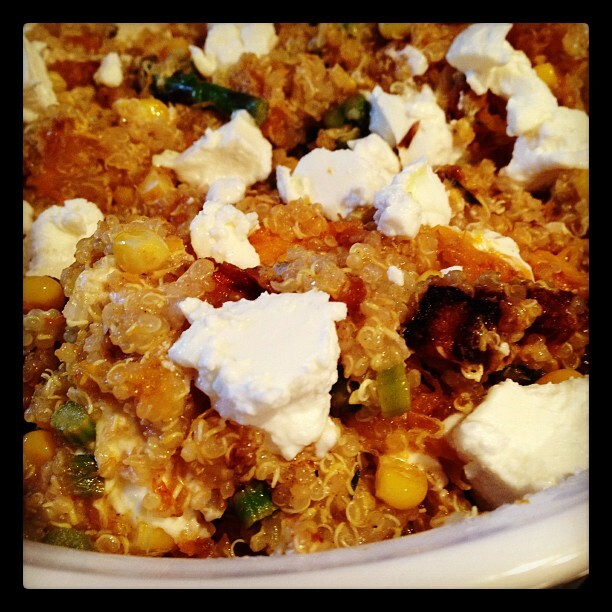 Put the quinoa and pumpkin in the bowl and mix the pumpkin through. It’ll break up as you do this so there with be some nice chunks of pumpkin but also smooshy pumpkin through the whole thing. Pour in your corn and stuff and mix that thorough. Crumble as much chèvre as you desire on top. You can make this for me anytime, or all the time. Totally up to you. I wish there were leftovers for nomming for lunch.